Item # 316501 Stash Points: 295 (?) This is the number of points you get in The Zumiez Stash for purchasing this item. Stash points are redeemable for exclusive rewards only available to Zumiez Stash members. To redeem your points check out the rewards catalog on thestash.zumiez.com. 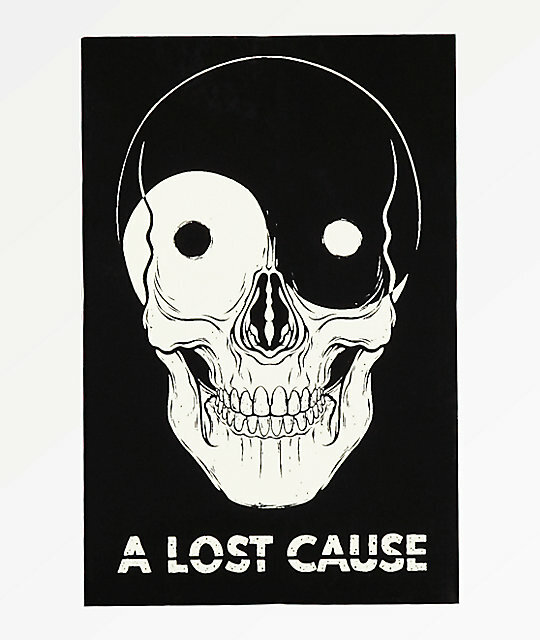 Give your sticker collection some eerie new style with the A Lost Cause Yin Yang Skull Sticker. This sticker has the graphic of a large skull with a classic Yin Yang emblem for eyes and a script logo below in white for clean branding and style. Yin Yang Skull Sticker from A Lost Cause. Skull with classic Yin Yang graphic for eyes and a script logo beneath in white. 5" x 3" | 13cm x 7.5cm (approx. ).